Whether you love them or hate them, there can be no denying that Jedward have made their mark on popular culture, releasing an album and appearing in several iconic TV shows such as Celebrity Big Brother and the Eurovison Song Contest, but how much do you really know about the larger-than-life duo? 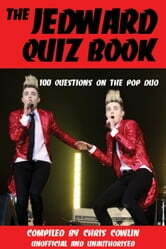 Now is your chance to find out with the 100 questions in The Jedward Quiz Book. Which year were John and Edward born and where in Ireland are they from? Who originally created the name ‘Jedward’? Which one of the twins has a pointy right ear? The answers to these questions and more can all be found in this exciting new book.Full of fascinating facts you never knew about the Jedward boys, this book is both fun and informative and is a perfect way to test your knowledge with friends and family. This book will appeal to all Jedward fans and anyone interested in finding out more about one of the most unlikely success stories to emerge from The X Factor. The Little Book of Piss Funny!